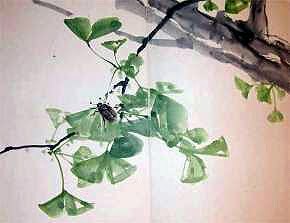 Japanese print: Beetle on Ginkgo leaf, c. 1920. Visit Ronin Gallery, New York to see an enlargement. Ginkgo trees in fall in Showa Memorial Park, Tokyo - Tachikawa, Japan. HD-Video by hanazakurasakura on YouTube. * Get free updates by email of this forum-blog. * Added Feedburner : get updates of forum-blog and website via email. Johnny Ginkgoseed tells his story of germinating Ginkgo seeds on his blog. He illustrates his experiences with many photos. Osaka in Japan: “Midosuji Illuminations” , Ginkgo trees along Midosuji Street with bright LED lights. This longest street in Japan stretches approx. 1.9 km. 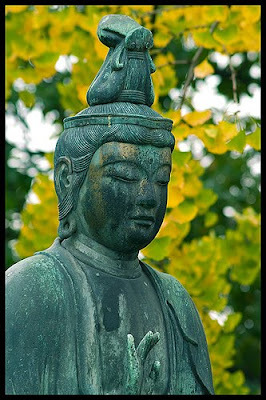 Illuminations: Dec 14, 2011-Jan 22, 2012, c. 17:00-23:00. Video by markbasser on YouTube. * Added pdf to search-sitemap and FAQ page of my website. * New photo + video photospecial page: Ginkgo biloba tree in fall. 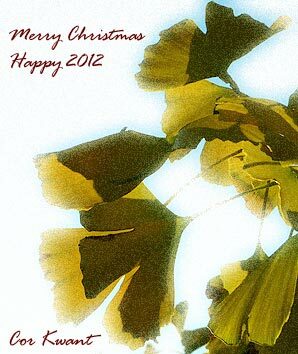 * Added photos of Ginkgo seedlings on Propagation-page. 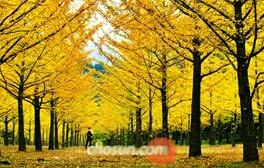 Ginkgo Avenue: 70 Ginkgo trees in fall on the campus of Hokkaido University in Sapporo, Japan, attract many interested people. Video by jg8gwx on YouTube. "The 43,000 sq. m ginkgo forest in the foothills of Mt. Odae has been opened to the public for the first time in 20 years. The forest is about the size of a baseball stadium, and many of the trees are over 30 years old. The healthy trees are planted in a straight row 5 m apart. The owner, Yoo Ki-chun, bought the abandoned land 20 years ago and planted ginkgo trees. He opted for the trees because the soil was wrong for cultivation as an orchard. He recently decided to open it to the public. The forest draws a string of visitors who can't resist walking along them to soak in the essence of fall." Cited from: Arirang, Korea's global tv website: on their website you can watch a video of this forest. In Antwerpen (Belgie) werd een stadsgedicht - de Vertelboom en de 10 takken der verwondering - ingehuldigd, onderdeel van het stadsdichtersproject 'Bomenstad'. Het kunstwerk 'Cornerstone' van Roel Jacobs zorgde voor inspiratie. Zijn levend Ginkgo boompje dat in 2010 in de collectie van het openluchtmuseum Middelheim werd opgenomen was dan net 1 jaar. Roel Jacobs vertelde inspirerende boomverhalen en rond de Ginkgo kwamen de woorden van de 10 deelnemers, immigranten uit alle delen van de wereld. Peter Holvoet-Hanssen maakte er een stadsgedicht van dat in september werd onthuld in het Paleis op de Meir. In Antwerp (Belgium) a city poem - de Vertelboom en de 10 takken der verwondering - was inaugurated. It is part of the project 'City of trees'. The artwork 'Cornerstone' (in open-air museum Middelheim) by Roel Jacobs provided inspiration by a living Ginkgo tree. Roel Jacobs told inspiring stories and standing by the Ginkgo tree 10 participants (immigrants from all parts of the world) spoke their words. Peter Holvoet-Hanssen made ​​the city poem from their contributions. Buddhist statue set against the yellowing leaves of a Ginkgo tree in the garden outside of Sensō-ji in Tokyo's Asakusa area. Photo by Eric Flexyourhead on Flickr.com.